* This same motto is used by Daniel de Superville on p. 403. Cf. also the poem written on this same motto by Andreas Gryphius. With this I recommend myself into the memory of the possessor [of this book]. In Leiden, on May 27, 1715. Bernhard Albinus (Albin, Weiss) was born on January 7, 1653 in Dessau, a son of the Mayor of Dessau Christophorus Albinus, a grand-grandson of the historian Petrus Albinus (1543-1598). He learned in Dessau, Bremen and Leiden. Here he obtained his degree of doctor of medicine. Then he spent some years by travelling in the Netherlands and in France. In 1680 he became a professor of medicine in Frankfurt an der Oder. Here he established a theatrum anatomicum, mainly on his own costs. He won such a reputation with his scholarly and practical achievements that Frederick William the Great (1620-1688) appointed him his court physician and real secret councillor in Berlin. He fulfilled these posts until the death of the Prince-Elector, and then he returned to Frankfurt. In 1697 he became court physician of Prince-Elector Frederick (1657-1713), the later Prussian King Frederick I. In 1702 he accepted the repeated invitation of the Government of the Netherlands to head the Department of Medicine of the University of Leiden, and although Frederick William I (1688-1740) invited him to Berlin in 1715, he never returned there. He died on September 7, 1721 in Leiden; his funeral oration was delivered by Herman Boerhaave. He was engaged in almost all fields of medicine. Three of his sons became renowned professors of medicine: Christian Bernhard (1696-1752) in Utrecht, Bernhard Siegfried (1697-1770) and Friedrich Bernhard (1715-1778) in Leiden. His works are, amongst other: Oratio de ortu et progressu medicinae. Leiden, 1702. – De incrementis et statu artis medicae sec. XVII. Leiden, 1711. – Our Library keeps Gustav Daniel Lipstörp's dissertation defended under Albinus' presidence. 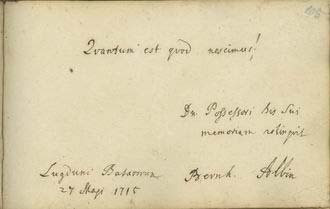 Both the 62 years old professor, and his son Bernhard Siegfried Albinus (p. 429) wrote only a short note in the Album. Their handwriting tends to be similar.